The Amfilissos river and the streams that flow into the bay of Balos in the central south coast of the island of Samos permeate an area rich in cultural and ecological inheritance. The area was once famous for the creation of fine pottery, exported through ports in the bay of Balos. Over the centuries, the inhabitants of the villages in the area have developed a variety of rural activities: farming and harvesting olives, fruit, nuts and vegetables in harmony with nature, together animal husbandry and fishing. In the middle ages, Amfilissos area of Samos was peaceful and prosperous, and the inhabitants were left to look after themselves, with the major threat coming from pirates who would sail along the coast, spying, for villages to ransack for provisions and treasures to to steal. Fear of attack by pirates led to the almost complete depopulation of the area in the 15th century, but inhabitants began to return a century later.The villages in the Amfilissos area reached their peak population in the first part of the 20th century. During the last part of the 20th century, fishing from the ports in the bay of Balos declined, as did some labour-intensive forms of agriculture, like harvesting of olives, carob beans and nuts. Summer seasonal tourism in the Amfilissos area has increased substantially over the past 20 years, focused on resorts in the bay of Balos. 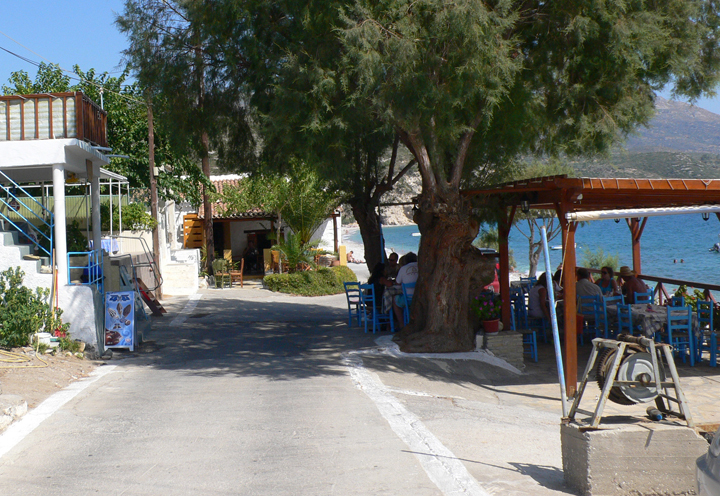 Nowadays, day visitors come from the towns of Samos to enjoy the beach and restaurants and bars. Package tourists, mainly from Northern Europe, come to stay in hotels and rented apartments, usually for 1 or 2 weeks. This has resulted in an increase in beach-side hotels, apartments and restaurants and bars in Balos and Pefko . At present, longer-term visitors come mainly from the Greek mainland and diaspora. 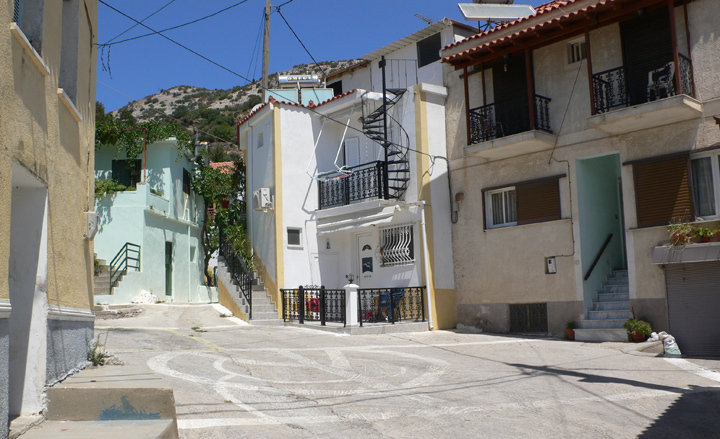 These include previous inhabitants of the area, who come to visit, and stay with, the remaining members of their families who still live here, or return temporarily to houses in the Amfilissos area, that they still own, for holidays. However, apart from Ormos Marathocampos, a small port 4km to the west of Balos, where a new marina is now being built, the villages in the Area (Skoureika, Neochori, Koumeika) have, as yet, seen little influx of tourism, despite having renovated village houses available for rent. Their population has declined: the school in Neochori closed in 2000, and very few pupils remain in the schools in Koumeika and Skoureika. Young people, who have grown up in Samos or would like to find work in Samos currently are faced with a variety of local problems that make it very difficult for them to live and work in the Amfilissos area, particularly if this involves practising their professional and creative skills. The Amfilissos Network is now active, with the aim to bring together the key actors from Samos, and worldwide, in developing the initiatives and projects that will operate in parallel, making an integrated effort to overcome the problems, and increase dramatically the variety, richness, connectivity and creativity of life, work and recreation in the Amfilissos area.